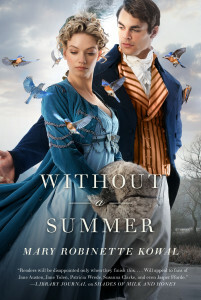 Without a Summer is the third book in the Glamourist Histories series, after Glamour in Glass. Jane and Vincent, recovered from their adventures in Belgium, have taken on a new commission in London. They bring Melody with them, hoping that being in London during the Season will help her find an eligible husband. London is exciting for all the wrong reasons, though – it is unseasonably cold, and the glamourist guild of coldmongers is being blamed. And to top it all off, Vincent’s abusive family seems to want to meddle in his business again. This book goes back to the series’ Austen-esque roots, with all the fuss about finding Melody a husband, but it also keeps the political aspects from Glamour in Glass. The things that Jane experiences in this book is also very inspired by Emma (which is fairly apparent, but Kowal also acknowledges it in her afterword). Melody acquires much more depth in this book, partly because Jane starts seeing her beyond the role of “petulant younger sister”. I wouldn’t say that I was glad to meet Vincent’s family, because they’re such horrible people, but it was interesting to see them get fleshed out. I was hoping that the Vincents would continue working on developing their work with capturing glamour, but they have quite enough to do in this book, so I can’t actually say that I’m disappointed. The next book, Valour and Vanity, involves Jane and Vincent in Murano (as well as a heist!) so I’m pretty excited about that.